Our pricing is comparable to other property managers in the market, but with us, you have the added benefit of over 18 years in the industry and 10 years in business as one of the areas leading property management companies. Our employees offer more than 70 combined years experience in their areas of expertise. Several pricing plans are in place so you may select the one best suited to your needs. With so many headaches associated with property management, why would you not want a seasoned professional representing you? Issues are no problem for us. We handle them all. We firmly deal with tenant issues, streamline maintenance and minimize your risks. Pricing below represents a percentage of monthly rental amount. Minimum monthly management fee is $80. Leasing fee for tenant placement service is equal to 75% of 1st month's gross rent (minimum $500) for a lease term of 17 months or less; one full month's rent for a lease term of 18 months or longer. Additional fees may apply depending upon the service level you choose. For investors with multiple properties we offer full management at a reduced fee. For those who prefer a no hassle menu of services and understand the value we provide, we offer the following guarantees and priorities. Relax, we'll handle it! We are confident we will live up to your needs and remove your concerns. If, for whatever reason, you're not completely satisfied in the first 60 days terminate your agreement. No questions. Just let us know in writing that you wish to terminate our services and we will discontinue the contract with no cancellation fee. No hassles. See, we're already winning you over. We align our priorities with yours and have set up our compensation model such that leasing your property to a great tenant is in both our interests. Quick turnaround should be priority #1 when your home is vacant. We require a minimum of 7 days between tenants so we may schedule a proper comprehensive move out report and make any needed repairs/updates between tenants. Our marketing plan spans the globe and our top shelf cloud based property management system allows us to keep it all safe and streamlined. We are confident we will find you a great tenant as quickly as the market allows. Our days on market are among the lowest anywhere! If we don't find you a tenant during the term of our agreement, it costs you nothing! Although no property management company can prevent a tenant from breaking their lease we can and do guarantee if the tenant vacates for any reason other than a military relocation (the military has a get out of lease free card by law under certain circumstances) prior to 6 months into the lease we will not charge you the releasing fee. All you have to do is allow us to be the decision makers in the tenant selection process. That protects you from the sometimes confusing and ever changing tenant protection laws! 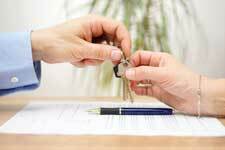 There are many legal pitfalls when evicting a tenant. We understand the laws and pitfalls that go with eviction and generally can save you the cost of hiring an attorney to handle evictions by handling most lease violation/non payment of rent evictions in house. We will always work in your best interests to minimize your risk and maximize the outcome in your favor.